Looking for decent toner for your HP printer but tired of the ridiculous prices? Look no further. 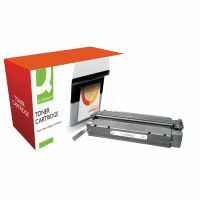 Q-Connect have designed a toner cartridge with the LaserJet 1300 Series in mind. It fits perfectly and delivers professional-looking documents time after time. The cartridge uses superior black toner for deep, even colour and a clean finish. Give it a try and we guarantee you'll be impressed by the quality and quantity of printouts. This item prints up to 2,500 pages.